This Ear Training material, performed on acoustic instruments only, was created from 2006 – 2011 as a research and development activity I did as a teacher in Ear Training at Rhythmic Music Conservatory in Copenhagen (RMC), Denmark. The main purpose with Ear Training 1 – 15 is to offer a substantial and comprehensive practice material, that focuses on one single topic in ear training: Functional pitch recognition. Functional pitch recognition involves identifying the function or role of a single pitch in the context of an established tonic, read more here. It is my conviction, that most students, I have worked with during my 14 years as a teacher at RMC and The Royal Academy of Music, benefit from focusing on this topic as their starting point in ear training. 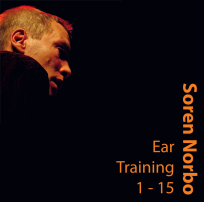 Ear Training 1 is a recording of my compositions with Søren Nørbo Trio. Each of the following exercises Ear Training 2 – 15 are systematically build up. Every exercise is recorded with acoustic instruments, and lasts 30-60 minutes. All exercises develop in a logical progression, and most of the exercises increases in level from easy to very difficult. Almost every exercise therefore adresses both the beginner and the advanced user. You can follow the chronology or you can skip from one exercise to another, to get different approaches to the practice material.